Bolt now has support for Extensions. Included with the download are a few basic ones: SimpleForms (to create contact forms and such), Google Analytics tracker code, "Tweet this"-button, "Facebook Like"-button, Facebook comments and Disqus comments. To create your own extensions, we refer to two completely new sections in the documentation: Creating Bolt extensions and Bolt Internals. Some screenshots here: Screenshot gallery. To help you create Extensions, we've cobbled together an Extension Wizard, to quickly create working boilerplate code for your own Extensions. Link: http://extension-wizard.bolt.cm. 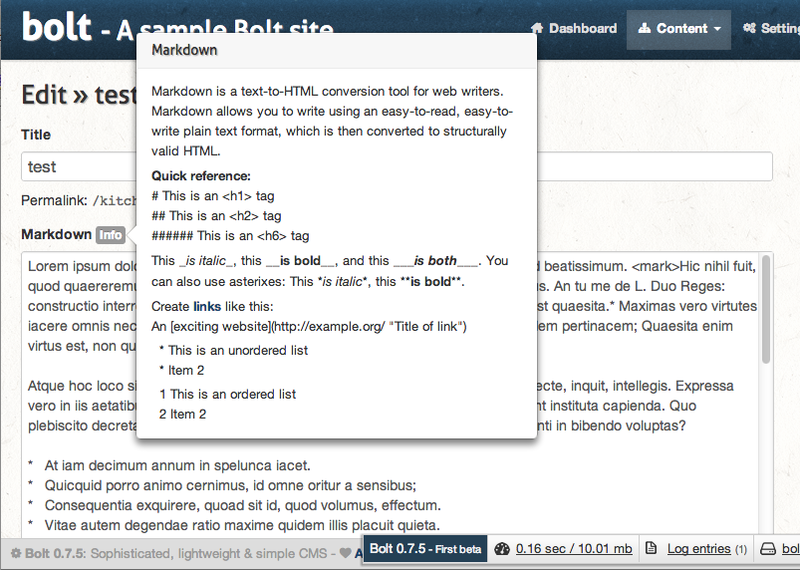 To keep it meta: We've built the Bolt Extension wizard to create Bolt Extensions as an actual Extension in Bolt. Besides the new features, we've also done a lot of work on the existing features: A lot of functionality is now even simpler and more straightforward than previously. We've done a lot of refactoring and cleanup in the code: Most of our own classes are now PSR-0 autoloaded and implemented as Silex service providers. We're also working towards making the code fully adhere to the PSR-2 coding guidelines. We've added a few Fieldtypes for in the Contenttypes: You can now add Geolocation and native Markdown fields. 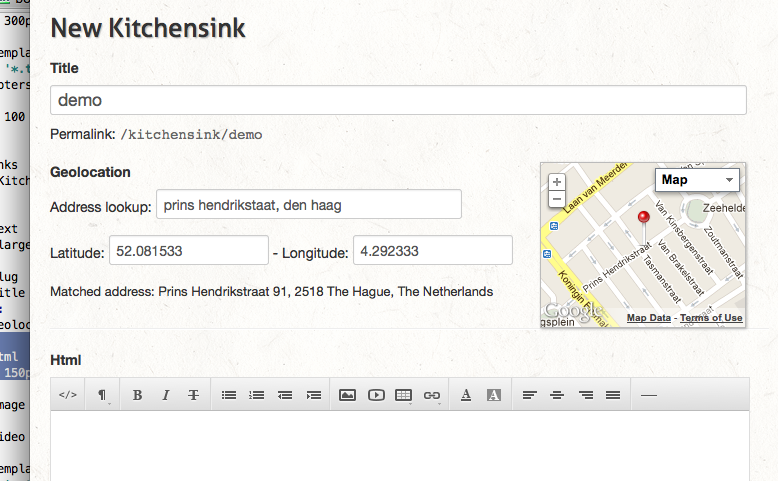 Screenshots: Geolocation, Markdown. More documentation has been written! Apart from the 'Developer documentation', we now also have a 'User manual' in both English and Dutch. Altogether the documentation is now over 16.000 words. So, in short, a lot of work has been done in the past month, improving Bolt in almost every aspect. The next beta is scheduled for early December. See the roadmap for details. To upgrade an existing install, or to setup a new one, just follow the instructions. When you do an upgrade, you will not overwrite your modified settings with the upgrade. You should still make a backup before doing an upgrade, though.